After a long day at work, the first thing one can think of is a long hot shower to wash away all the stress and fatigue. But what we do not always realize is that a great part of our relaxation time in the bathroom is owed to the bathroom design itself. 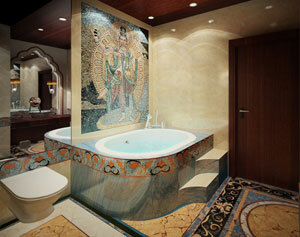 The first condition to unwind and enjoy a quality shower time is to have a comfortable and enjoyable setting. This is why you should be very careful to choose a design you fancy for your bathroom and decorate it the way you like. Mosaic tiles can be a great idea for both your bathroom wall and floor if you’re looking for a special touch and a long-lasting material.